In 1819, Benjamin Constant gave a speech at the Athenee Royal in Paris on how conceptions of liberty changed from the time of the Athenian polis to 1819. After a period of revolutionary upheaval in the United States and France, observed that in the ancient world citizens defined liberty in terms of their positive participation in the affairs of government, while in the modern world, citizens define liberty in terms of the freedom to secure the desires of their private lives. Constant (1988, p. 325) argued that “in the kind of liberty of which we are capable, the more the exercise of political rights leaves us time for our private interests, the more precious will liberty be to us.” The additional point that can be inferred from Constant (1988) is that democracy is an unfinished and on-going project that needs constant and continuous attention (Habermas, 1996). Others challenge Constant’s (1988) positive outlook and argue that the legitimacy of modern governments is in critical decline, citing falling public confidence and flagging interest in the democratic process (indices which include the low percentage of the electorate that votes; mistrust of politicians; cynicism about the political process and public scandals). Certainly one modern day determinant that will influence the shape and identity of democracy is the regeneration of information and communication technologies (ICT). The information era is based on the pivotal role of ICT, which now pervades all sectors of society—the public sector as well as the commercial and voluntary sectors (van Dijk, 2001). ICT-based applications provide a new way for citizens to participate in the democratic process through improved • Interactivity: Two-way communication/debate between citizen and government • Speed of Communication: Offering the possibility for politicians to rapidly obtain impressions of citizen’s opinions • Reach of Scope: Providing links from politicians to groups with which they were not previously in contact On the positive side, ICT enthusiasts foresaw the Internet creating a public space free of interference, both from government control and commercialism. They proposed that new “information highways” facilitated by ICT will open alternate pathways to democratic participation, namely electronic democracy comparable with Jefferson’s (1984) vision of 1834, involving a network of highways which would open new lines of communication between the American States cementing their union by “new and indestructible ties.” The Jeffersonian vision is captured by today’s “amplification theory” of technology, holding that ICT enables citizen participation, inducing qualitative changes in society (Agre, 2002). However, ICT also poses threat, a new form of control. Electronic surveillance of the work place is particularly effective because it is reflexive—“management” monitors workers as well as itself (Whitaker, 1999, p. 40). At the societal level, it creates and re-creates new structures and new futures. These newly emerging structures, although variously named as “Virtual Feudalism” (Mowshowitz, 1997); “Post-National State” (Whitaker, 1999); “New Serfdom”; “IT-Harems” (Korac-Kakabadse, Korac-Kakabadse, & Kouzmin, 2000) or “New Shoguns,” all depict increasingly invisible, all-seeing, all powerful control mechanisms, first envisaged by Bentham’s 1 Eighteenth-Century (1787/1995) “Panopticon,” depicting citizens loss of freedom. The Panopticon vision of totalitarian, electronic control, is a compelling metaphor because it represents the architecture of modern power (Whitaker, 1999, p. 28). In the information age, the global political economy (globalizing markets) and its major tenants—corporate business and its representatives and lobby groups, exert unprecedented power on sovereign states to introduce “business-friendly policies” which, in turn, lead to (Korac-Kakabadse et al, 2000; Mowshowitz, 1997): • A retreat of the State (via privatization, outsourcing, and the hollowing out of public functions) and an increase delivery of public services by private parties which exercise authority in their own name rather than in the name of the law which transcends their own power • A blurring of lines between public and private sectors • Growing disparities between wealth and poverty and between and within regions and communities (e.g., fortress and affluent suburbia versus desolated quarters) • A growth of private security and “private justice” These increasingly business-friendly policies lead to corporate control over impoverished, sovereign governments and the transformation of “citizens” into “customers.” The process of being rendered a “client,” diminishes the value of citizen rights and equity, as clients with higher disposable incomes can afford to procure higher levels of rights and opportunities. 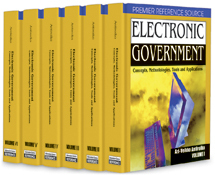 A growing literature highlights that ICT-mediated democratic relationships are not challenging the fundamental ordering of democratic processes but, rather, traditional bureaucracies are being replaced by “infocracies” as explained by technology “reinforcement” or “enactment” theory emphasising how ICT further reinforces existing power and social control structures (Agre, 2002; Fountain, 2001; Korac-Kakabadse, 2000). New ICT reproduces and strengthens institutionalised socio-structural mechanisms, “even when such enactments lead to seemingly irrational and ostensibly sub-optimal use of technology” (Fountain, 2001, p. 5).